John Holladay’s Falmouth High School graphic design students are making their mark in the halls of Falmouth Public Schools. “Bolder and Bigger is Better,” is a multi-phase project to create student-made murals for all Falmouth schools. In the spirit of the project’s name, it has grown over time. 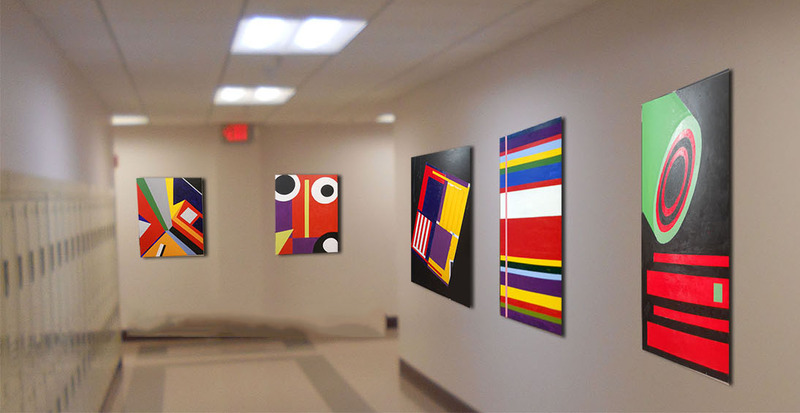 The inspiration came from seeing artwork decorating the expansive walls of Falmouth Hospital, and the initial grant, awarded to Mr. Holladay for the 2012-2013 school year, funded printing supplies, paint and boards for eight murals – one for each school. A subsequent grant enabled the project to expand to include the School Administration Building, school libraries, and additional works which are quickly filling up the formerly barren walls of FHS. FHS Principal Joseph Driscoll has also offered financial assistance. “We never could have done this without FEF because the printing is very costly,” Mr. Holladay said. He added that the grant served as the impetus for the establishment of a new cross-discipline mural class at FHS. Mr. Holladay’s Graphics 1-3 students design the murals using software such as Photoshop or Illustrator, print them large-scale and work in groups to paint them. Technology studies teacher Jim Brooks constructs display boards allowing for the artwork to be changed in the future. While smaller murals can be completed as solo projects, sophomore Alex Manos enjoys the opportunity to work with his classmates. “I like the large murals because you get a chance to collaborate with other kids, so there is a team aspect to it,” he said. 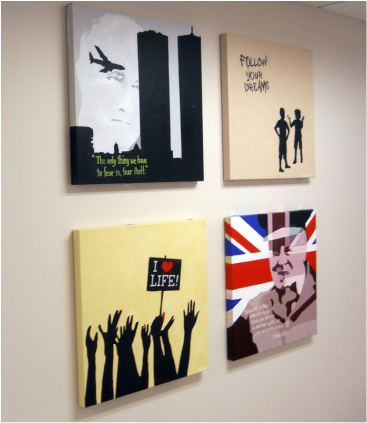 The democratic process also comes into play when choosing the subject matter, which ranges from brightly-colored geometric shapes in the math wing, to work reminiscent of Banksy and Shepard Fairey representing the various disciplines, such as Abraham Lincoln and Teddy Roosevelt in the history wing. Although themes must be approved by faculty, staff, and administration, the project offers the artists a forum for self-expression while serving as a time capsule of their world. One series of contemporary portraits celebrates individuals who have made an impact on the students, ranging from entertainment to cultural figures, including director James Cameron; talk show host Ellen DeGeneres; rapper Macklemore; artist Mark Ryden; Apple co-founder Steve Jobs; Civil Rights activist Martin Luther King Jr.; Pakistani activist Malala Yousafzai; Olympian Michael Phelps; and South African president and activist Nelson Mandela. Senior Brittney Woodward, an artist who is new to graphic design, also stressed the impact made by Mr. Holladay. Junior James Bailey believes the project has not only changed the aesthetic of the school but also the energy. Joseph Driscoll underscored the students’ sentiments.